For some time I have been working with adapting the business model canvas for explaining how an enterprise architecture program delivers value to the it-department. The scope of the model has been on the foundation architecture where the outcome of the enterprise architecture program is mainly used by the IT department. I am aware of that Tom Graves has done something similar, though he has made a completely different model, and as such his model is fine, but the audience that I intend to communicate with would be more likely that they will understand the value proposition of enterprise architecture through a model designed upon the business model canvas compared to a model based upon Graves’ model. 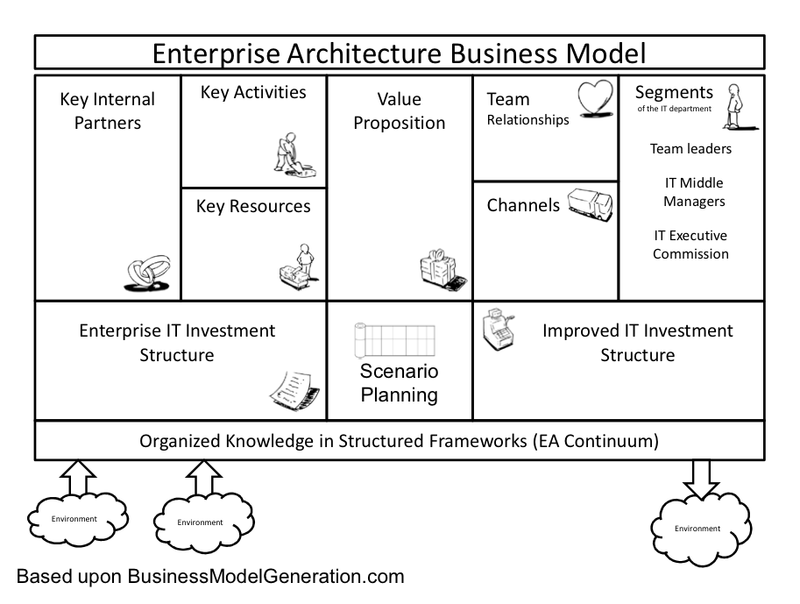 As you might have guessed then I had to adjust the business model canvas in order to expose the data on how the enterprise architecture program delivers value in the best way possible. The first seven phases have been renamed in order to adapt the model for how a department or function within an IT department delivers values. The first phase is about key partners needed in order to produce any form of value by the enterprise architecture program. The second phase is about how the key activities that are needed in order to produce value. The needed activities would have to be organized around on handling the resources. The third phase is about the key resources needed to produce the services or products needed by the segments of the it department. The fourth phase is about the value proposition. In other words its about the initiatives at hand. The fifth phase is about team relations and they are usually essential for both implementing and producing the services. Especially if we assume that enterprise architecture is about creating value through others. The seventh phase is about the segments of the IT department that receives the services from the Enterprise Architecture program. The eight phase is about the Enterprise IT Investment structure. This particular section of the business model deals with the identification of how the current situation of the IT Architecture the IT organization processes. The ninth phase is about scenario planning, that deals with planning for a better IT Investments for the IT department. The tenth phase is about the Improved Enterprise IT Investment Structure that deals with multiple actionable plans for changing and optimizing the total architecture. All together these phases can present the necessary data to the decision-makers in order to give them an insight on how enterprise architecture delivers value to them. Value is key in situations where organization have limited access to resources. The foundation architecture is as earlier mentioned scoped on delivering value to the IT department and through to the IT department to the rest of the enterprise. The model is published under the Creative Commons license (share alike).